In other news, I am officially skint. So to make some quick money i'm selling a few bits on eBay. I always complain about how much I hate it because the fees are so offensively ridiculously high. But at the end of the day, i'm poor, and I need money fast. So it will have to do. Please check out my items for sale here! The sunglasses was an absolute bargain! 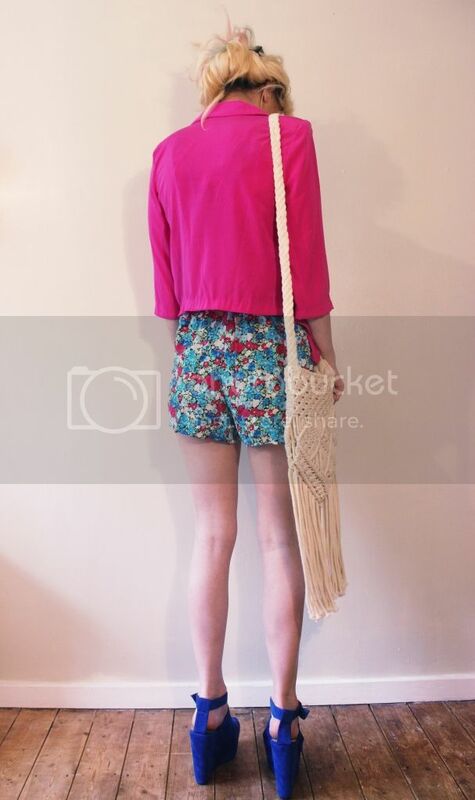 Such a lovely playsuit and love your fringed bag! Loooove how bright this is! And the matching lippy! Gahh I know what you mean about eBay, fees are so expensive! They need to do another 'free insertions weekend' asap! Love everything about this outfit, especially the sunglasses, they are so cool! I love what you've done with that first picture too!! Yep, I'm selling stuff on ebay too, hoping to make some cash money. I don't think the fees are TOO bad personally. Oh, and before I forget, lovely floral outfit! Your shoes are gorgeous! such a lush colour! you look amazing in such bright, bold colours! and i agree with you on ebay :( waah! Love the blazer and glasses-so cute! I love how you edit your pictures, so cute! I love how bright and colourful this is.. really well put together. I think you're my new blog crush haha!